This scenario features randomized mechanical and story elements, which means that each time you play it will be slightly different. These randomized elements include what special abilities the enemies have, the atmosphere of the planet, attitudes and cultural quirks of the locals, what corporation the colony once belonged to, and much, much more. I was super impressed with how completely these randomized elements could change the scenario. However, with a scenario this randomized it’s really up to the GM to sell the environments, characters, and atmosphere. As such, it's replayability rests solidly in the hands of GMs. If you run it as is it will fall flat on the second play through. Replayability aside, this is a really great introductory SFS scenario. This makes a better scenario then a repeatable. If you play this once, its a memorable space combat, you have great roleplay with what you discover on the planets, and have fun exploring. The combats are on the easy side, but it makes a great intro scenario for new players. As a scenario it would be a solid 4 stars. As a repeatable however, it gets boring real quickly. The enemies change, a little bit, as do the creatures and their reasons. But the rest is pretty much the same. If you've seen it once, youve pretty much seen it all. The method of making the scenarios is pretty fun with the random tables, but its just not enough to keep it interesting for more then once. As a repeatable its only a 3 star scenario. In a way it is a rather simple adventure, but quite rich and with nice depth. The boards at my first review so to keep this significantly shorter, good idea, but the difficulty really ruined this one for me. 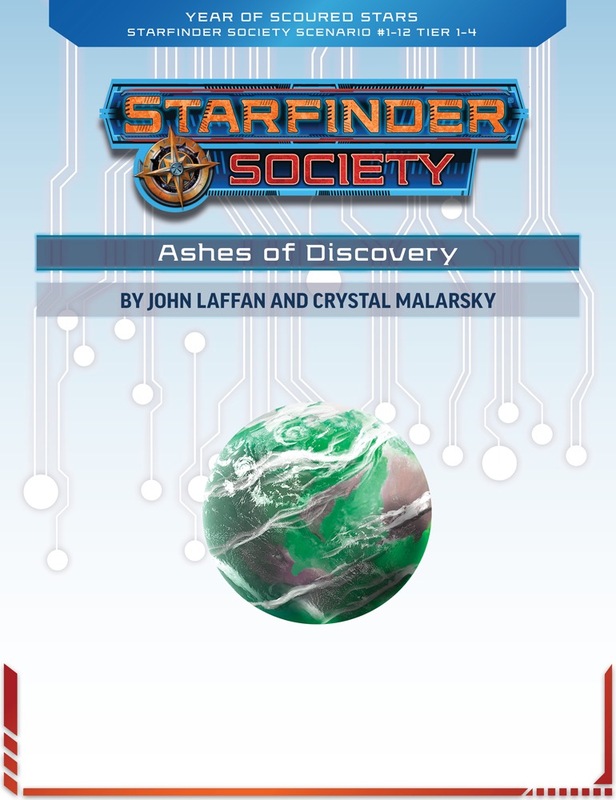 Although I've run every Starfinder Society scenario up to this point, Ashes of Discovery is the first time I've been a player in one! This review is based off that experience and reading the scenario after the game. I recognise the criticism some people have online that it's far too easy but, although it may have just been the rum, I had a great time playing it. I don't mind an occasional softball scenario when, like this one, it's designed as an introductory, repeatable scenario with randomized elements. I think it gives players a good taste of everything Starfinder has to offer. The premise of Ashes of Discovery is that the Starfinder Society has been contracted by an external organization to explore and secure a staging outpost abandoned centuries ago on a planet in Near Space. After battling what's (essentially) a giant space shark in starship combat, the PCs land on the planet near a village of native inhabitants who can, with good role-playing and the right skill checks, be persuaded to take the PCs to the abandoned outpost. On the way to the outpost, the Starfinders have to survive treacherous weather and rescue a native lost in the storm. The outpost itself has been fortified by an exiled member of the natives and has to be overcome through force. You probably noticed from the summary above that it's very vague. Which organization contracted the SFS? Which planet is the outpost on? What are the natives like? What kind of storm are they facing? What kind of threats are in the outpost? I had no idea while playing it, but *all* of these elements are randomly determined (or chosen) by the GM prior to the session. The hiring organization, for example, could be AbadarCorp, the Church of Desna, the Hellknights, the Knights of Golarion, the Skyfire Legion, Ulrikka Clanholdings, Veylen Enterprises, or the Xenowardens. The choice has cascade effects on the planet's biome, the outpost's security, the type of storm the PCs must brave, etc. In addition, the GM is given an unusual amount of discretion to customise almost everything about the scenario (including the native inhabitants) to "fit" the randomly determined elements and provide a unique experience for the players. I've played repeatable scenarios with some randomized encounters (like The Commencement and The Confirmation), and I can safely say they have nowhere near the amount of randomly determined elements as this one does. Although the core through-line of the plot is the same, almost everything else is mutable--which is exactly what a repeatable scenario needs! The scenario starts with a mission briefing by Guidance that concisely explains the goal of exploring the abandoned outpost. It's not particularly memorable, but it does get things moving quickly. On the way to the planet, the Starfinder's vessel is attacked by a "Besmaran whelp", a living creature the size of a starship that has massive teeth, claws, and a spiked tail. The creature also has some randomly determined special powers. Starship combat has never been a challenge in any of the SFS scenarios I've played (though I've heard that may be changing soon), so after a couple of rounds of combat I had my drug-addicted PC abandon his post for a quick fix and a nap. We still won handily, which is a good indication that the Besmaran whelp was way underpowered. It's a cool *looking* challenge, even though (in practice) it's a cakewalk. The next part of the scenario is a classic first contact encounter. The starting attitude and interests of the native inhabitants depends heavily on their randomly-determined physical and cultural traits. This is essentially a role-playing and skills challenge, as a certain number of successful checks are required to persuade the natives to help point the way to the outpost. Again, which checks are useful depends on their particular cultural traits, and different classes or races might get bonuses when interacting with them. In the session I played in, the natives were led by solarian elders, so my solarian PC was viewed favorably. Travelling to the outpost requires surviving randomly-determined weather hazard--it could be anything from rock storms to blasts of hellfire and more. Survival isn't hard, but the idea is to slowly wear down the PCs before they rescue a trapped native and then press on to the outpost. The outpost features the most dangerous thing in the session: a laser security trap. Traps are appropriately lethal in Starfinder, one of the things I really like about the system. The Exile's special abilities (and motivation) are randomly determined, as are the nature of his minions. The minions only have 6 hp each and are dispatched with laughable ease, and the Exile himself is also a walkover (though he did hit me with a nasty crit--the jerk!). Computers in the outpost contain data that explains why the outpost was abandoned, and the more creative the GM, the more interesting the conclusion will be for the players. Ashes of Discovery isn't going to impress anyone with it's encounter design or difficulty level, but I thought it was a really clever scenario that (unlike most) encourages GM creativity. I would happily run it or play it again, just to see how different rolls on the tables can change the gameplay. Oh, wow, another replayable so soon? And this one includes Starship Combat, so PCs can get a taste of that. Trying to make it diverse from #1-01: The Commencement was important, which is also why this scenario takes place in the Vast and is intended to be more in the same style as #1-03: Yesteryear's Truth. Can not to get my hands on this. More introductory content the better. Thurston, are there any map updates on the newest scenarios? I like to order mine in advance if I can . . .
interesting. So this scenario is meant moreso as a step off point for new characters, as opposed to a continuation of the main story? My group has played straight through 1 to 9, as well as into the unknown and the 1-00 pregen scenario, so they're going to be out leveled for this one. This scenario is stand-alone and makes an excellent choice for new characters! Is it repeatable the same way as in PFS? Play it as many times as you want at first level but only once 2nd level or up? All repeatables in SFS are repeatable in their full level range. So in this case 1-4. Hello, I just downloaded this, not sure if I'm going blind, but I can't see the blank version of the custom map. does anyone else have the same issue? Hello, I've just asked a friend that purchased this scenario, and she says that a blank copy of the "Abandoned outpost" was missing from her copy as well. If you select the map and copy it into another program you will have a blank copy. I really like the customization a GM can do with this adventure. I think it says it takes place in Near Space. Also I have some questions/suggestions. Do all living starships NOT have shields? I couldn't find any shield data for the Besmaran Whelp. Also, the land based combats are not just too easy, but way too easy. I sure hope the combats get an errata boost. Another option would be to have the exile let the storm into the complex (opening rooms up) while the enemies have forcefields against it or somesuch. That would make a tense confrontation. Thank you! that worked a treat! While the besmaran whelp does not appear to have shields this does not appear to be a universal starship creature trait as both the endbringer devil in starship form and the novaspawn from Alien Archive have shields. Hmm...that's a bummer because with that few hull points the combat is over in 3-4 rounds. Not much of a starship battle, imho. This scenario needs some beefing up. I don't think this is much of a spoiler as it is a clarification on what's what, but during the mission briefing with Guidance it lists that one organizations hiring out to look into the planet is the Hellknights Order of Nail, mean while on the table to help determine some specifics it lists Hellknights Order of the Pike? Is it just misinformation or did I stumble onto something much bigger, like a potential Hellknight Coup? Am I sure I don't have a corrupted scenario or is my tin foil hat wearing thin?